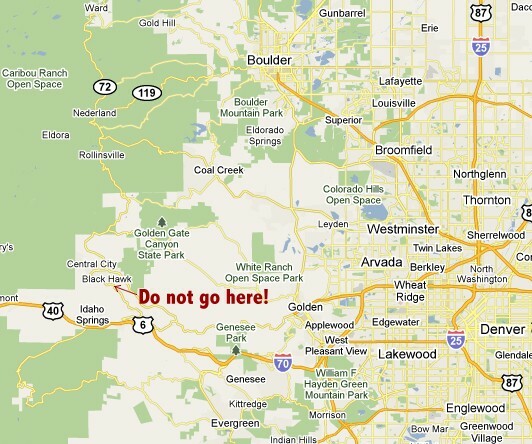 We have a town in Colorado that will not allow bicycles to ride through the town. Anywhere. At all. No bikes. This is so hard to believe. The town indeed has "public" roads, tax-payer paved public roads. Granted they have a lot of gambling drinking buffet eating tourists in that town, and it may not be safe to ride a bike in Blackhawk anyway, but that doesn't matter because I couldn't even if I wanted to. Now I don't want to. WARNING to anyone going on the 2011 Bicycle Tour of Colorado or 2011 Ride the Rockies, or later visiting Colorado to watch the ProTour race Quiznos Pro Challenge - don't ride your bike through or near this town, you will be ticketed. And by all means please don't spend a dime in this town either. Any other town in Colorado will happily receive you, your bike, and your money. Bicycle Colorado has taken the situation with Black Hawk seriously from the beginning, and we are considering a variety of strategic options based on this most recent ruling. 1.Please sign up for our eNews to stay informed on the issues and be ready to act! 2. Register the Colorado Bicycle Summit on February 7-8, 2011 as we unite Colorado bicyclists and meet with our state legislators. Sign up today. 3. Here is one basic reason why Bicycle Colorado exists-countering the threat of bike bans. If you want to see this ban overturned and prevent bans from spreading to other Colorado roads, please become a member of Bicycle Colorado and add your name to the list of people working to protect bicyclists’ rights.